Six years ago today I published my first ever blog post. By now I have published 304 (this is #305) and have 184 drafts in the works. I love blogging and I appreciate every kind word and constructive suggestion I get. Thank you readers, old and new! 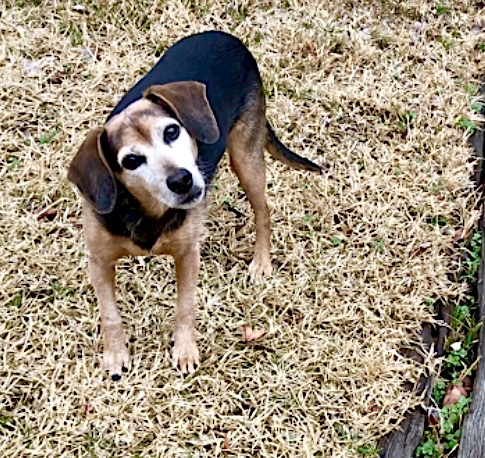 Here’s what’s going on for the dogs, for me, and the blog this year. It’s been an eventful year since my fifth anniversary at Eileenanddogs. 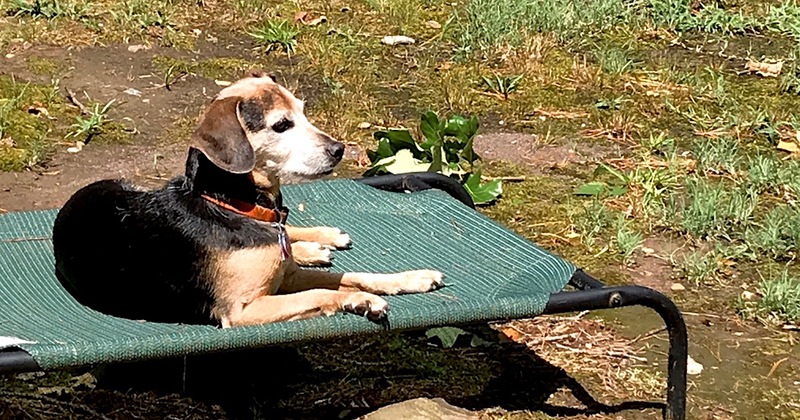 The worst event by far was the loss of my eleven-year-old dog Summer last August. She had inoperable hemangiosarcoma. She was so healthy otherwise I would forget she was aging at all. I thought we had a good five more years. Maybe this is the time to announce I am writing a book about her. She’s the one who brought me here, after all. And she, out of all the dogs I have known, was the most like me in temperament. I miss her quiet presence so much. I have so many projects going that her book won’t be out all that soon. I have a good start on it. Then I realized that writing a book about our life together needed to be more than a simple chronology. I detoured into reading memoirs for a while. I didn’t like any of the memoirs with animals in them though, so we’ll have to see what I come up with. The second hard thing this year was Zani’s accident in February. She slammed into a fence running at high speed. (Actually, I think Clara slammed her into it.) She got a spinal cord concussion but is recovering beautifully. 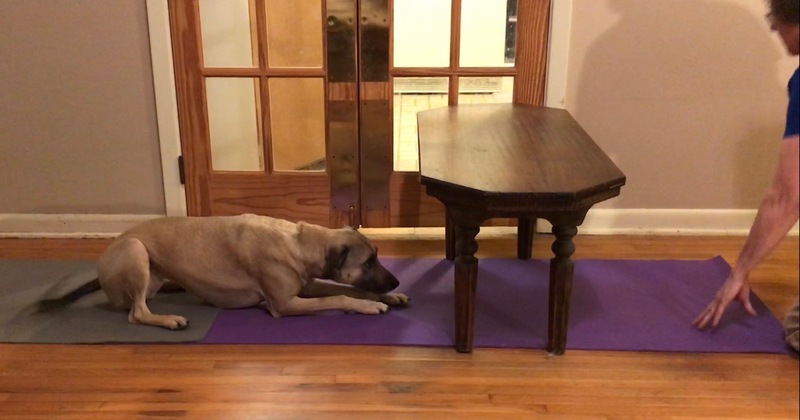 We recently saw a rehab vet and I will be more proactive about careful exercises for her. But she has bounced back well on her own, and both her vets have reported no discernible pain. Yes! Clara continues to be my sweet, smart, beloved puppy. But all grown up. The work I have done with our trainer has paid off beyond my wildest dreams. Clara the snarly puppy with the stressful feral puppyhood (and probably stressful time in the womb as well) has developed into a steady, even extroverted dog. Her world has gotten big. She deals with things like vet visits better than many “normal” dogs. And she is simply lovely to live with. I have big news in my personal life. I am retiring from my day job on July 31, 2018. Yes, in less than two weeks I will be a full-time writer and consultant! Calling the job I’ve had for 18 years a “day job” doesn’t do it justice, though. I have been privileged to work for a breast cancer program that allowed me to provide real, tangible help to impoverished women who had breast cancer. I learned so much about the lives of the poorest of the poor and how to help. My organization was able to help women who had so many strikes against them. And we saved lives. I don’t say that in a vague, rhetorical way. I know of about 50 women who are alive today because of my program. But funding was dwindling, so in April 2018 we dissolved the agency. We probably could have scratched along for another year, but my work partner and I were ready to retire from it. It’s a shame that there was no one to carry it on, though. But I am so ready to write, edit, teach, and create full time. I will be offering the writing mentorship through IAABC again. I have Summer’s story to work on. And I have two other big projects coming out, both probably debuting in the next few months. Oh, and I’m hanging out a shingle. I am available for hire as an editor or proofreader for dog-related writing and some other genres. I’ll have a little ad in the blog sidebar soon. But if you are interested, you can contact me anytime through the contact page on the blog. I am so happy to be able to offer this. The first three and the fifth are the same as last year. But the “No More Cutting” post, where I describe how to make dog treats in a pyramid pan, jumped up from out of the running into fourth place. And it bumped off my “Operant Learning Illustrated by Examples” post, which is a bit disappointing. But I’m glad that people come to my blog for any reason. Maybe some of the recipe seekers will stick around for the rest! The post I’m proudest of this year is the one on the matching law: Herrnstein’s Matching Law and Reinforcement Schedules. I worked on it on and off for years. I’ll be creating some other posts on that topic. I know it comes off as pretty technical, but studying the matching law is probably the one single thing that taught me the most about training. Give it a try! I’m also keeping my Video Examples for Teachers page up to date with the posts that trainers most often use for their clients. 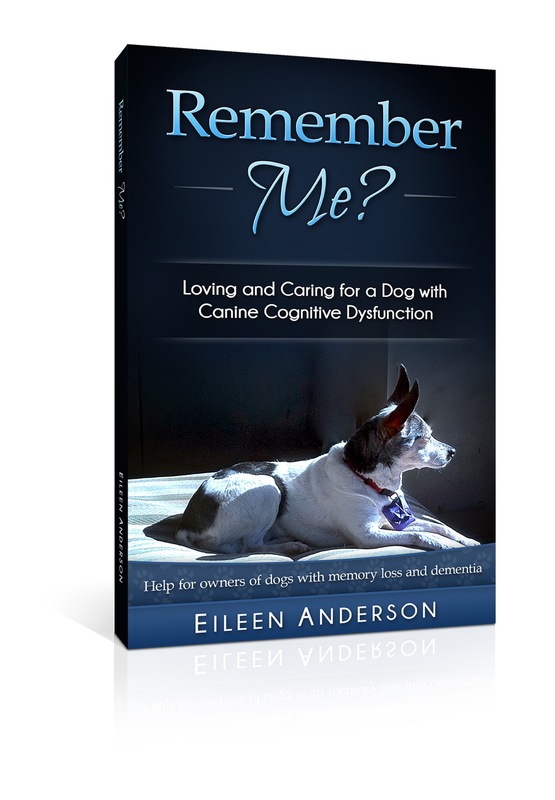 My book on canine cognitive dysfunction is selling well, and I updated that website a bit. I need to create a second edition in the next year or so. I have more to do on the website as well. I finally have a “testimonials” page. Rather than asking people to write testimonials, I stalk approach people who say nice things about my book in public and ask to use their remarks. But if anyone I missed wants to contribute one, please let me know! 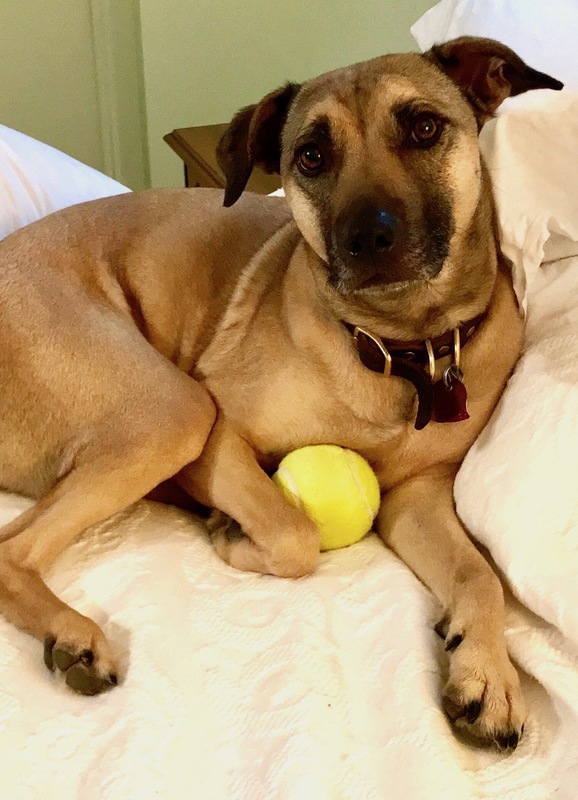 I was featured on the Fenzi Dog Sports Podcast in April and had a great time chatting with Melissa Breau. A Dutch television program used some of my canine cognitive dysfunction footage on a program that included that topic. Finally, I will have three articles in Clean Run magazine later this year, one of them a biggie assessing the available tools to help sound sensitive dogs. I had five in the magazine last year, which you can find in these digital issues from 2017: August, September, October, and December. For those who made it this far, here is a silly video from before Zani’s accident. My dogs are not allowed to play on the bed so this was an oddity to begin with. I don’t remember how it started. But I was pleased that Clara quit when I asked her to (the second time, ahem), and Zani…well, you’ll just have to see. This entry was posted in Announcement, Event announcement, Milestone, Retrospective and tagged anniversary, blogiversary. Bookmark the permalink. ← My Dog Is Afraid of the Clicker. What Should I Do? 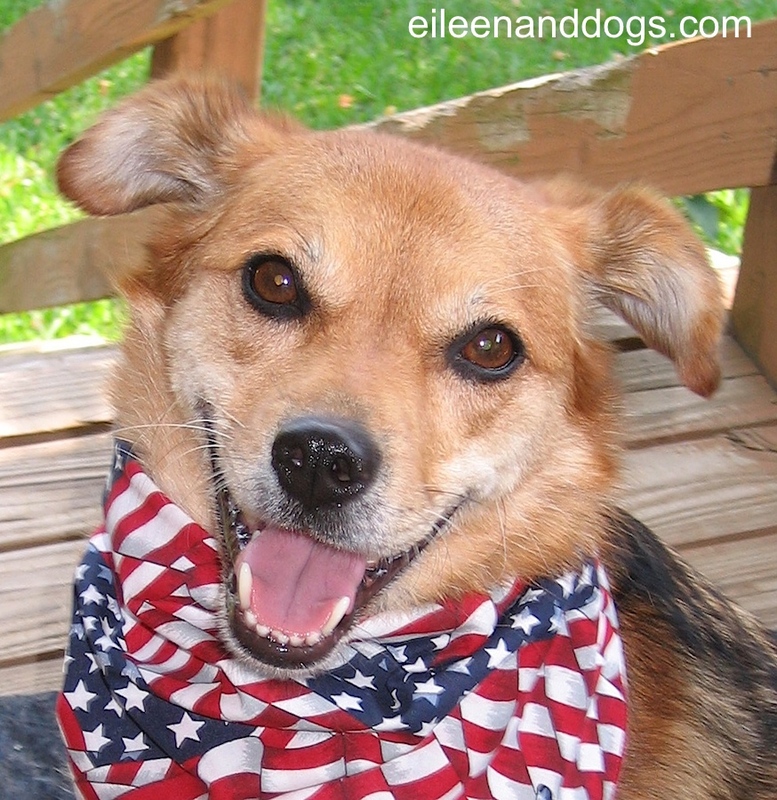 13 Responses to Eileenanddogs’ Sixth Anniversary! Congratulations Eileen! Well done 🙂 Your blogs are absolutely great! Congratulations – six years of well-researched and fascinating blogs is impressive! We have learned so much (much more than recipes!) as we’ve followed you for the last several years. I’m not sure if congratulations is the right word for your retirement from your “day job”; it’s a shame that funding dwindled, as it sounds like a very worthwhile program. There are so few safety nets for health care for people with few resources. But have fun with the next steps forward in your life! Best to the dogs and you! Thank you, Chris! Yes, it’s sad that our program had to end. But 22 years is a pretty good run for a small non-profit. And we did have some money left over that is going to be used by another non-profit to distribute to the same population we helped, and it should last for a while. Thanks for your kind words! For me, I was ready to move on. Well Done Eileen! That video made my day!! I’m laughing out loud. Please keep us the good work. Glad you liked the video, Ann! They are endlessly entertaining. And thanks for the kind words! Congratulations and all best wishes for your future – it sounds so exciting and I am looking forward to more good reads. Thanks, Claire! I plan to keep writing! This blog is still where I have the most fun. Thank you and back atcha my friend! Happy Anniversary and massive thank you for all your blog, Eileen. When I first started learning about dog training I discovered your blogs and it resulted in a massive paradigm shift in not only way I understand dogs but myself and other humans too. Thanks for your kind words and thanks for letting me know specifically which blog was helpful. That feels great to know! Thank you, Rose! That’s big R+ for me!